ASX-listed Kalamazoo Resources (ASX: KZR) is a gold and base metals explorer whose primary focus is on identifying commercial mineral deposits to explore at its Castlemaine Gold Project in Victoria and its two gold-base metals projects in Western Australia. Kalamazoo listed on the Australian Stock Exchange on 16 January of 2017. 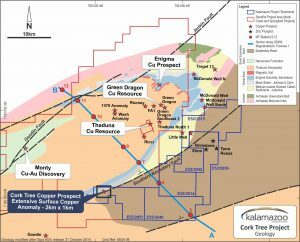 Since that time, Kalamazoo has successfully added value to its Snake Well Gold and Base Metals Project and the Cork Tree Copper Project. At Snake Well, which is located in WA’s Murchison region northeast of Geraldton, Kalamazoo increased the total Mineral Resource (JORC 2012) by 32% to 141,000ozs (ASX: KZR 20 November 2017). 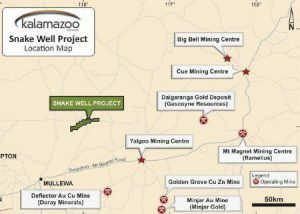 On the 14th November 2018, Kalamazoo announced the sale of the Snake Well Gold Project to Adaman Resources Pty Ltd (ASX: KZR 14 November 2018 and 27 December 2018) for $7.0 million. The sale proceeds will be payable over 24 months and will fund Kalamazoo’s exploration and drilling program at the Castlemaine Gold Project, Cork Tree Copper Project and the Pilbara Gold Projects. As part of the transaction Kalamazoo can elect to engage Adaman to provide up to $4.0m of drilling services (deducted from the sale proceeds) at the Castlemaine Gold Project, which if exercised further fast-tracks Kalamazoo’s drilling program at the project. Another key component of the sale was the retention of a 2.5% Net Smelter Royalty on any base metals mined within the Snake Well project area. 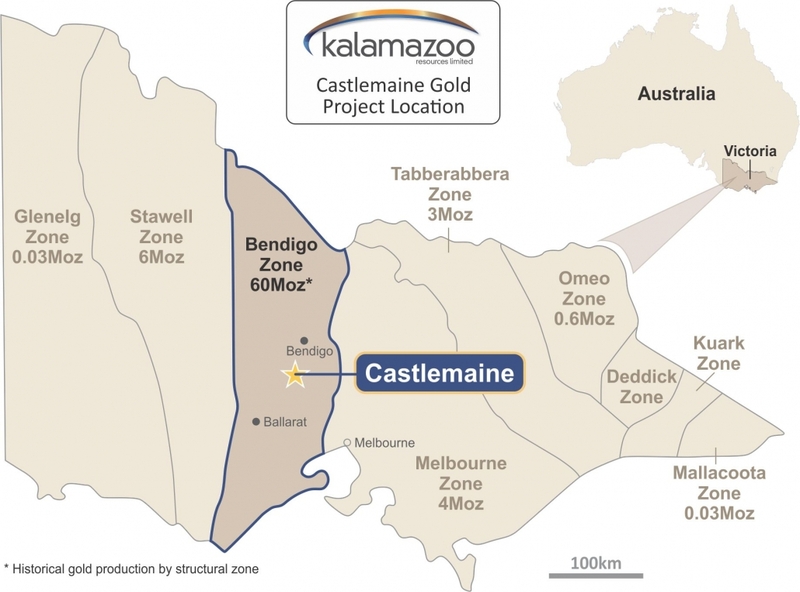 Kalamazoo’s Exploration Licence 006679 lies immediately east and south of the town of Castlemaine and covers almost the entire historic Castlemaine Goldfield for an area of 70km2. Combined with the application for Exploration Licence 006752, covering an area of 218km², the total tenement holding (once granted) is 288km2. In comparison to the other fields within the Bendigo Zone, the Castlemaine Goldfield has not been tested comprehensively at depth leaving open the prospect of repetitions of mineralisation at deeper levels. The recent exploration success that has been achieved by Kirkland Lake Gold (ASX: KLA) at the Fosterville Gold Mine demonstrates the substantial gold prospectivity that the Victorian systems can possess at depth (Fosterville’s production is expected to grow from the current target for 2018 of over 330,000 ounces to 570-610,000 ounces in 2021 with grades expected to average approximately 30 grams per tonne - refer to ASX: KLA 13 December 2018). 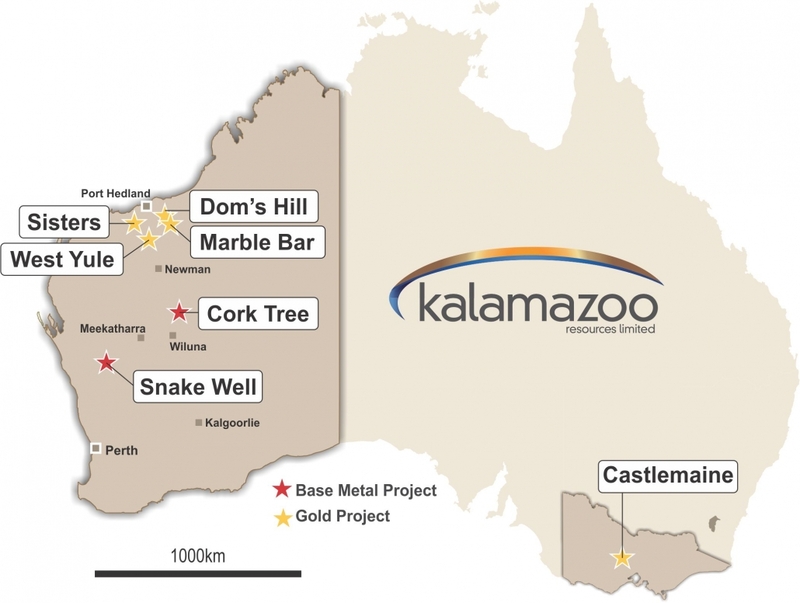 Kalamazoo has also been able to secure from Castlemaine Gold Fields the project’s entire 200GB+ database, including 3D models of various deposits and the entire drill core farm. Only limited exploration has been conducted and certain modern exploration techniques, for example gravity and seismic surveying, have not been utilised within the project area but have proven to be very effective at Kirkland Lake’s Fosterville Gold Mine. 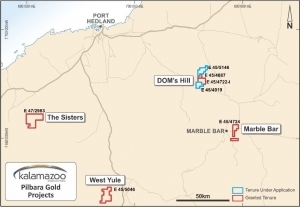 KZR is exploring at its Cork Tree Copper Project north of Wiluna in the Doolgunna region, southeast of Sandfire’s (ASX:SFR) Degrussa and Monty copper mines. A surface copper anomaly has been identified on the Cork Tree tenements with a footprint of over a 2km² area and further exploration is planned. In 2017 KZR acquired three highly prospective gold projects in WA‘s Pilbara region covering 252km² (ASX: KZR 6 October 2017, ASX: KZR 17 April 2018). Subsequently, Kalamazoo made applications (ASX: KZR 10 November 2017) for the highly prospective tenements E45/5046 and E45/5146. The tenements have the potential to host significant gold mineralisation. The projects are within proximity to some of the Pilbara’s most exciting gold projects and located in proximity to the gold projects of Novo Resources (TSX.V: NVO), Artmeis (ASX: ARV), De Grey Mining (ASX: DEG), Venturex Resources (ASX: VXR), Impact Minerals (ASX: IPT), DGO Gold (ASX: DGO) and Calidus (ASX: CAI). Figure 4. Cork Tree Project : Location, Tenements and Significant Copper Projects, in the Doolgunna region, southeast of Sandfire NL’s De Grussa mine and the Talisman/Sandfire Monty mine.